Viability of forest bird concentrations were derived from recent assessments by the USGS/BRD. 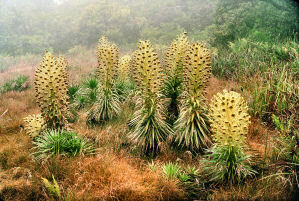 Ecological systems in the Hawaiian High Islands Ecoregion tend to be of small size. Lowland dry forest, such as this stand at Pu'u Wa'awa'a, Hawai'iIsland, is often invaded by fire adapted alien grasses that create andmaintain destructive fire regimes. One school of thought in conservation is that efforts should be devoted to viableecological systems, communities, and species. Efforts to conserve inviableconservation targets are typically expensive and prone to failure, and are best saved for explicit restoration projects.It is good practice to devote finite conservation capacity to securethe most viable conservation targets. The Conservancy's policy isto maintain viable targets, recognizing that lower viability ecological systems,communities and species require important restoration work led byour partners with mandates and expertise in that realm ofconservation, such as the U.S. Fish and Wildlife Service, the U.S.Forest Service, and the National Tropical Botanical Gardens. The size of a population or the areal extent of a natural community orecological system can affect its viability. Size is a measure of areaor abundance of a conservation target occurrence. Size of a species occurrence may include area of occupation orpopulation counts, while size of a natural community or ecologicalsystem is typically its areal extent). In general, largersize is related to ability to persist under chronic stress. Condition is an integrated measure of biotic and abiotic factors,structures, andprocesses related to the "health" of a conservationtarget. For a species, this may include reproduction, levels ofcompetition/predation/disease, andpopulation structure. For natural communities and ecological systems,condition relates to overall structure and biotic composition, andpresence of typicalsupportive ecological processes. Good condition is generally related toability to recover from natural or anthropogenic disturbance. Landscape context is a description of the spatial aspects ofconnectivity or access to other populations, species,and ecological processes in the surrounding habitat or landscape.Landscape context rank decreases when surrounding areas are disturbed,fragmented, or lacking supportive processes. 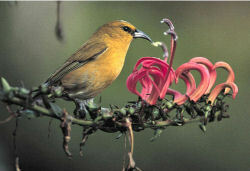 Aviability assessment was not developed in the 1998 Hawaiian HighIslands Ecoregion Plan, and constitutes a major new component of thecurrent assessment.Applying the above criteria to Hawaiian ecological systems, natural communities,and special features required characterization of the specificbiological requirements and supportive ecological process for each. These key ecological factors were then ranked into Very Good, Good, Fair, and Poor categories. Afuller discussion of the size, condition, and landscape context for all conservation targets is provided in the Appendices. Summary discussions and ranking criteria are provided below. Viability of ecological systems is also referred to as ecosystem integrity. Applying the criteria discussed above to Hawaiian ecologicalsystems incorporated sizes appropriate for our islands, conditionfactors relevant to the structure and composition of our terrestrial(largely vegetated) systems, and landscape context factors consideringthe major ecological processes and patterns of threats. Size -Hawaiianecological systems are small, even at their full originalprehistoric extent, making them particularly vulnerable to disturbanceandloss. For example, a loss of 25,000 acres on a smaller island such asLāna‘icould completely destroy repre­sent­ation of the LowlandMesic System. Indeed, aside from remnant stands of diverse mesic forest, this hasoccurred. Relationships between habitat area and species richness inHawai‘i argues for the need for the largestpossible protected areas to prevent species loss. 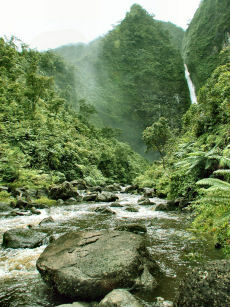 The largestecologicalsystems in the Hawaiian Ecoregion occur on the Island of Hawai‘i,so an average prehuman ecological system size for that island(ca 75,000 acres) wasselected as a reference standard for a rank of "Very Good," withsmallerpercentage increments of this standard established for lower ranks.Sizes were derived from Hawai‘i GAP landcover, using GISanalyses. Condition - Condition of terrestrial vegetated ecological systems wasassessed via the prevalence of native plant composition and structure in canopyand understory of vegetation across a given occurrence of an ecological system, compared toreference conditions of exemplary stands of natural communities described forthe system. Expert opinion assessing native cover in canopy and understory, andcomparisons of vegetation structure and composition to exemplary stands werecombined. Weacknowledge that this is asurrogate for the full complement of associated vertebrate andinvertebratefauna accompanying vegetation, and that the faunal elements play animportantrole in condition: providing ecological functions such as pollination,propagule dispersal, selective herbivory, trophic guilds, etc. A fullerdiscussion of the condition aspects of viability is provided in the Appendices. The criteriafor the condition ranks are summarized in the table below. VERY GOOD >90% of vegetation in ecological system with major elements of native composition and structure in canopy and understory. 75 – 90% of prevailing vegetation with native composition and structure. FAIR 50 – 75% of prevailing vegetation with native composition and structure. 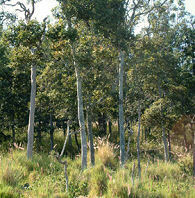 POOR <50% of prevailing vegetation with native composition and structure. Landscape Context - Thelandscape context of Hawaiian ecological systems recognizesthat the status of lands surrounding a particular system occurrenceplays a role inits viability. The optimum condition is to have an ecological systementirely surrounded by native-dominated adjacent systems that buffer the focal system fromstresses, andcontribute to its ecological processes. The worst situation is a systemsurroundedby degraded lands (and their anthropogenic stresses), oralien-dominatedvegetation bearing potential invasive species, or lands that otherwiseinterfere with normal ecological processes. VERY GOOD >90% of ES boundary with native- dominated surrounding lands. GOOD 75 – 90% of ES boundary with native- dominated surrounding lands. FAIR 50 – 75% of ES boundary with native-dominated surrounding lands. POOR <50% of ES boundary with native-dominated surrounding lands. After size, condition, and landscape context ranks were assessedand assigned to every ecological system occurrence in theecoregion, overall ranks were assigned for each system according tostandard TNC algorithms used in Conservation Area Planning (CAP). high water quality and oligotrophic conditions. VERY GOOD Primarystream length >3 miles and/or stream flows in range of highest qualityreference streams (>50 cfs median flow) or average flows >80 cfs. 10-50 cfs median or average 20-80 cfs. FAIR Stream length [0.25 – 1.5] miles and/or <10 cfs median or average <20 cfs. VERY GOOD "Unimpaired" and "supporting" streams in Kido et al 1999. GOOD "Mildly impaired" and "partially supporting" streams in Kido et al 1999. "Substantial" streams in HSA. FAIR "Moderately impaired" and "partially supporting" streams in Kido et al 1999. "Moderate" streams in HSA. POOR "Impaired" and "non-supporting" streams in Kido et al 1999. VERY GOOD >95%of stream surroundings in natural setting from source to mouth w/intactriparian vegetation and <5% in disturbed, erosion-prone, urban, or intensiveagricultural landscape, lacking intact riparian corridor. GOOD 85– 95% of stream runs through natural setting. 5 - 15% lacking intact corridor. FAIR 75– 85% of stream runs through natural setting. 15 - 25% lacking intact corridor. POOR <75% of stream runs through natural setting. >25% lacking intact corridor. The three species concentration targetsselected (rare plants, native forest birds, and endangered waterbirds)have been the focus of a variety of conservation agencies. We usedinformation from experts, existing assessments, and field surveys, as well as recent statewide assessments of these targets by the US Fish andWildlife Service, the US Geological Service, Biological ResourcesDiscipline, and the State of Hawai‘i Department of Land and NaturalResources, Division of Forestry and Wildlife, that identified trends insize, condition and landscape context leading to the criteria provided in the appendices. Summarizing the viabilityranks assigned to all selected conservation targets across theecoregion yielded the summary table (see below), documenting a pattern of highestviability for remote, high-elevation ecological systems, as well asgood viability for all species concentration targets except rare plantconcentrations. The next step in theassessment process is establishment of conservation goals via selectionof viable conservation targets to add to a portfolio of sites. Abbreviations: SU= Stratification Unit; ES = Ecological System target; ALP = AlpineSystem; SUB = Subalpine System; MD = Montane Dry System; MM = MontaneMesic System; MW = Montane Wet System; WC = Wet Cliff System; LW =Lowland Wet System; LM = Lowland Mesic System; LD = Lowland Dry System;DC = Dry Cliff System. Other Conservation Targets: CPS= Continuous Perennial Stream; FBC = Forest Bird Concentration; RPC =Rare Plant Concentration; WBC = Waterbird Concentration. Islands: NII = Ni'ihau; KAU = Kaua'i; OAH = O'ahu; MOL = Moloka'i; LAN = Lāna'i; KAH = Kaho'olawe; MAU = Maui; HAW = Hawai'i. Conservation Areas: NII= Ni'ihau; KAU = Kaua'i; OAH = O'ahu; EMO = East Moloka'i; LAN =Lāna'i; KH = Kaho'olawe; EMA = East Maui; WMA = West Maui; KOH =Kohala; MK = Mauna Kea; WML = Windward Mauna Loa; K-K = Ka'ū-Kapāpala; KON = Kona; P-P = Pōhakuloa-Pu'u Wa'awa'a. When applying viability ranking to coastal conservation targets, anumber of differences with terrestrial targets emerge, because ofdifferent natural disturbance regimes, as well as biogeographicalattributes such as dispersability, connectivity, andendemism. Therefore, a different set of viability criteria wereestablished forcoastal targets, and these are discussed by target type below. Coastalvegetation tends to occupy a narrow zone along the coastline, undergoesmore frequent natural disturbance, bears generally lower levels ofendemicity, and is more dynamic in both structure and composition, thanterrestrial vegetated ecological systems. Thatis, adaptation to natural disturbance regimes results in a coastalsystem thatis more variable in space and time. The influence of the ocean isstrongest along the interface between sea and land, a linear boundaryfeature. In this regard coastal and riparianvegetation both tend to be more linear, and it is difficult to applyarealsize criteria in the same manner as for terrestrial ecologicalsystems. Viability of anchialine pools was assessed by using the number of poolsin a single geographically isolated pool complex as a surrogae forsize, presence of native anchialine pool species (and absence of alienspecies) as an indicator of condition, and nature of land use andvegetation surrounding the anchialine pools as a measure of landscapecontext. Size of seabird nesting concentrations can be assessed by the number ofspecies breeding, and the sheer numbers of individual birds typicallypresent at an occurrence. Condition is likewise correlated with thenumbers of birds that can be consistently supported at an occurrence,and landscape context was assessed by the vegetation and land usepatterns adjacent to the occurrences.